The Markosian Library at the Taylorsville Redwood Campus will be going through some major changes in order to better serve the information and learning needs of students at Salt Lake Community College. “We’re having some very exciting changes,” Dr. Tiffany Evans, dean of the library said. Some of the most noticeable changes will be those made to the bottom floor. There will be a new area created that will be called the Math Emporium. In the Math Emporium, students will be able to work on their own or with a tutor or instructor. This will replace the math lab upstairs. There will be some new additional classrooms created as well, along with a large computer lab. In the Math Emporium students will be able to work self paced, or with a tutor or instructor, and in small groups, or complete self-paced modules. The second (top) floor of the library will also be going through some changes. There will be a new quiet study area put in, and the group study space will be moved up from the basement. As part of the renovation process, the library conducted a large “weeding” project. Weeding is a practice that all libraries conduct to make certain that collections are kept up to date and that room for new materials, resources, and services is made available. 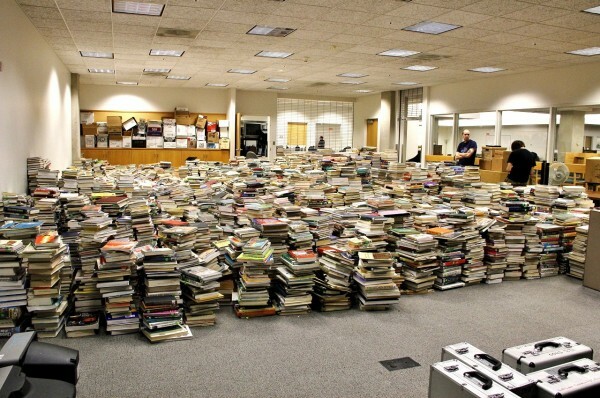 Approximately 27,000 books were weeded, or taken out of circulation. Books are de-accessioned when their content becomes out of date, damaged, or when they have not been loaned or accessed for at least five years. All of these books were packed into a room on the bottom floor of the library in the northwest corner. The library was selling these books for twenty five cents apiece. These books were not novels or non-fiction books. Last week the surplus department spent a couple of days picking up these books and moving them to a storage location. The books that were moved out of the library will not be destroyed. Some will be sold to book vendors, some will be donated, and some will be sold to the public. The rest will be recycled; none will be destroyed or thrown out. When taking care of materials that are college surplus, the surplus department follows procedures that are developed and set by the state. They also follow college operating procedures when dealing with these materials. “We do what the state requests,” Ed Benson, supervisor in charge of SLCC fleet surplus, central receiving and recycling department said. “I’m very conscientious about the tax payers’ money, and taking care of the college assets,” Benson said. Although the library is making changes, that is not the only reason for purging the older and out of date materials. All libraries routinely weed books off of their shelves to make room for more current and relevant material. As a result the library routinely has book sales throughout the year.